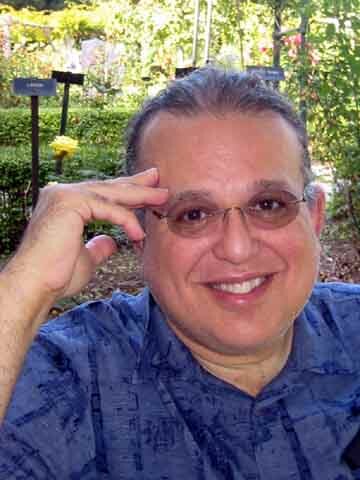 One year ago composer, percussionist and CalArts faculty member John Bergamo passed away. He was a talented and inspiring man. Back then I wrote about him in this post. Last night CalArts held a tribute to John. It took the form of a concert on which all the music was John's. Most of the performers were John's students. Many other alumni were in attendance. It was a pleasure for me to see and talk to those people who shared the same formative experiences which shaped my own musical life. Naturally, many pictures were taken. Percussionists play multiple instruments - mallets, drums, gongs. In John Bergamo's world just about anything could become a percussion instrument. For example, the intermission feature, called On the Edge, was performed on a large metal aircraft engine cowling set up in front of the stage. Look for it in the first picture. The concert began with the CalArts Percussion Ensemble, i.e. current students. They played John's early 1963 modernist piece entitled Interactions. It has a modernist title to match. Interestingly and positively, all the performers were women. Percussion has been a traditionally male bastion. I guess the future comes to CalArts first. Two solo mallet works were on the program. Three Pieces for the Winter Solstice for vibraphone (1963), performed by Jeff Brenner, is very coloristic and familiar to me. Five Short Pieces for Marimba, played by Justin DeHart, was written in 2000 in a much more virtuostic manner. First time I had heard it. Here's an important fact about all-percussion concerts: it takes great amounts of energy and time to move and adjust the instruments. Half way through the first half of this concert such a reorganization took place. I made a video of this non-musical portion of the program. Why I wonder. The change was done very efficiently in a soothing blue light; it's like watching a cheap noir movie of avant-garde dance. The voice you'll hear is that of David Rosenboom, a composer/performer who makes his living as Dean of the Herb Alpert School of Music at the California Institute of the Arts. His job last night was to talk to the audience about John Bergamo during this particular transition. David chose to take the very long view, putting John's career as a musician in the context of five millennia of human musical history. He also talked about snare drum rolls and Christmas music albums. Meanwhile, the stage is awash with moving performers and stage hands. Or, if you will, imagine David Rosenboom is performing the part of John Cage, lecturing as a Merce Cunningham-like dance company performs randomly behind him. I think David Rosenboom's assertion that the era of the imperial composer, one who writes but does not perform music, is coming to an end after 250 years is probably a bit premature. John Bergamo was definitely a composer and performer, but then again so were Mozart and Beethoven. Here's my favorite frame of the video. This was a high tech concert, tastefully over amplified. In the video they are setting up for a performance by The Repercussion Unit, an all-percussion rock band founded by John Bergamo and a bunch of other friends of mine way back in 1976. The previous post about John has video from an R-Unit tour of Germany. Among my pictures of the performance were several long sequences of nearly identical shots. I was trying to get one where focus was right, the performers weren't moving too much and something interesting was going on. As it turned out, these shots made for better animated gifs than for still pictures. You'll have to imagine the music, but you can definitely get a feel for the energy of the performances. First gif is the Repercussion Unit - left to right Chris Garcia (seated), Jimmy Hildebrant, David Johnson, Larry Stein, (you can see just the head of) Charles Levin, Gregg Johnson, Amy Knoles. And way on the right is one brief flash of the arm of M.B. Gordy. Sorry, M.B. On the second half of the concert there was hand drumming, one of John Bergamo's specialities. Another performing group, also founded by John, is called the Hands On'Semble. The members are Randy Gloss, Andrew Grueschow and Austin Wrinkle - also John's students. Since they went to CalArts during a different decade than I, I'm not sure which face goes with which name or what to call most of their instruments. They played magnificently along with two colleagues of John's, Swapan Chaudhuri and Houman Poumehdi. The piece is called Shradhanjali - a Hindustani word which means "thanks to the teachers". The finale of the concert was John Bergamo's most well-known composition, Piru Bol. You can hear many different versions of Piru Bole on YouTube. (The program says "Bol", You Tube says "Bole". You decide.) In any case Piru is a city near CalArts where John lived for many years. Last night it was performed by a large group of percussionists - I count 16 in this picture. For a while I focused on taking pictures of one quartet - Amy, Larry, Gregg standing and David seated - who had posed themselves artfully together. Everyone else on stage was putting out this much energy at the same time. The hand drumming performances were, for me, one of those magical musical moments. I could hear something great happening without knowing what it was exactly or how it was being done. I was experiencing the power of music. It is a strong primal power. It is the reason music has a 5000 year history and the reason music appears in every culture. It is the power that long ago made me want to become a musician and, somewhat later, want to study at CalArts. What I learned by studying music, alas, is that knowing too much about it can make you lose touch with the magic. Friends of mine have often heard me complain about my education at CalArts. Although my entire career is based on what I learned at CalArts and the people I met there, I've never really felt satisfied with my education. Last night, as this performance was coming to an end, I felt tears in my eyes and recognized a strange idea. I actually thought to myself "Gee, I'm glad I went to CalArts". There's a first time for everything. And indeed I am glad I attended CalArts, at least on that certain metaphysical magical musical level that I only get to touch on rare occasions. The people on the stage of the Wild Beast let me channel a wonderful musical energy one more time. I hope it happens to me many more times. I hope it happens to you too. It was a tribute concert and so there were speeches. Many of the speakers talked of how John Bergamo had touched their lives through music. And I knew exactly what they were talking about because John had touched mine as well. And last night he did it one more time. The spirit of John Bergamo was on stage at the Wild Beast during this concert. So was his picture. And then the concert ended. You know what they say - every high must have its low. I walked into the CalArts building, looking for the reception, and confronted a typical CalArts hallway. Alone in the endless whiteness of hallway hell, you easily can believe that Walt Disney really is buried somewhere under the building. It's an ART school, a DESIGN school, a MUSIC school, but the architecture can be simply antiseptic. A little interior decoration - some art on the walls - couldn't hurt, could it? A sound environment? Something. Then at the reception, more pictures were taken. I like taking pictures of pictures being taken. Here's one more. Over the years I've written a number of posts that are tagged CalArts. Click here to read them all. This is the third time I've ever mentioned David Rosenboom.